and get driver insurance up to Rs.10 lakh. 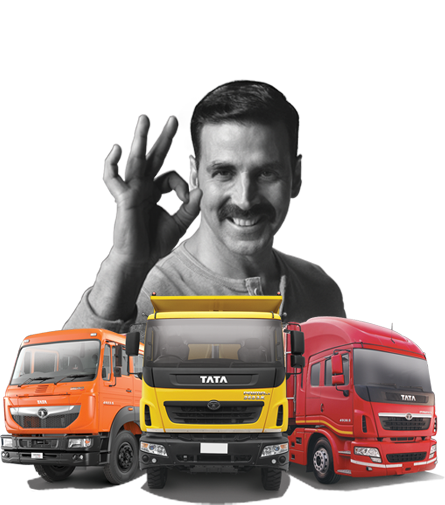 Recognizing the importance of Truck Drivers, Tata Motors enables customers to get Accidental Insurance Cover* for their drivers, as part of the Tata Delight program. All Tata Truck customers are provided with 5-year unnamed vehicle-linked Accidental Insurance Cover up to Rs. 10 Lakh against Death / Disability and up to Rs. 50,000 vehicle-linked Accidental Hospitalization Cover against accidental injury for drivers. So when you buy a Tata Truck, not only do you get the assurance of a world class product, but also insurance against the unforeseen, thereby ensuring non-stop business for you! Tata Trucks have stood the test of time and delivered value to customers operating in varied applications. Pioneers in product innovations as well as in segment introductions, Tata Trucks cater to a comprehensive range of cargo - market load, agriculture, cement, iron & steel, container, vehicle carrier, petroleum, chemical, water tankers, LPG, FMCG, parcels, white goods, ODC, perishables as well as application areas for construction, mining and municipal operations with multiple options of load bodies, tankers, bulkers and trailers. The Tata Delight program offers customers a host of other distinctive facilities across all Tata Motors dealerships, sales outlets and Tata Motors Authorised Service Stations.